First of all, blueberries rule. Yes, I happen to like blueberries a lot. They just might be my favorite food, and they’re known to be quite nutritious. Pretty good deal, right? Well, they also happen to be relatively expensive too. Going to the grocery store and buying a small 4 ounce container for $3.50 isn’t exactly a budget-friendly purchase. Admittedly, I get them from time to time because they’re delicious and a part of the healthy frugal breakfast I often have. So recently a group of us went out for the day and did something quite out of the ordinary for those of us in the crazy metropolis known as Chicago. We took a couple of cars and went blueberry picking! As in, way out to the country to some “u-pick” blueberry farms. I told a friend of mine (who wasn’t a part of this group) that we did this, and he raised an eyebrow. “Blueberry picking?” he asked. Despite his obvious thought that this was a lame way to have fun, I proceeded to tell him about why it was worth the time to do so, even in light of my view that time is more valuable than money in many cases. And oh by the way, it was worth the money too! The one thing that I’ll say up front is that it did cost some gas money to make the drive. That being said, there were quite a few people going and multiple vehicles, so the costs could be spread out. Plus we did some other things to make it a full day experience, such as hitting a winery, visiting a farmstand that sold amazing raw honey, and driving on the shoreline. Yes, you can do those things in the Midwest! So really, it was actually a full day out – of which only a part was allocated to blueberry picking. As for the berries, I have to say that there is nothing quite like picking them up right from the source. It’s a great experience that urban dwellers should take part in, as food from the farm just tastes a bit fresher than what is purchased at the store in many cases. You can just taste the flavors and feel the nutrition as you eat them off the plant. All told, I personally picked up just over 5 pounds of blueberries. The total cost was $7.50. Yes, the blueberries were only $1.50 per pound! You could pay 8 times that much at the grocery store for produce that’s not nearly as fresh. Or, you can go straight to the source and have fun doing it. The latter, if you have a chance to do it even once per year, is a fun and cost-effective option. I know that 5 pounds of blueberries is a pretty big amount. But they can be readily frozen and used for smoothies and recipes for quite some time. It was quite a fun day, and a real takeaway is that we can often find some winning combinations of experiences if we just keep our eyes and mind open to different ideas. Instead of snickering like the person I mentioned, the rest of us embraced the experience and bought a lot of incredibly fresh and healthy food for a low price, and had fun doing it! What are some money-saving purchases that you’ve especially enjoyed? Have you ever picked fresh fruit or vegetables? If so, did you get really good deals? Share the post "Saving Some Green on Blueberries"
We often freeze fresh fruits and vegs to help keep them longer and avoid waste. I hate throwing money away. Freezing is a great way to save money by avoiding wasting fruit, I agree. In my case, I fully expected to freeze the blueberries since I picked so many! Love blueberries! I remember camping with my family in Maine one summer and picking wild blueberries. We brought them back to camp and my Mom made blueberry pancakes, the best! Those sound like fun memories. We enjoy going together as a family here, at least for apple picking. I personally love raspberries, which are also expensive. I bet I could find a raspberry farm near me. I might just have to look into this! Give it a try! The berries just taste a little fresher and better immediate after being picked, which is a nice bonus. That was pretty good. We actually haven’t gone fruit picking at all this year… thanks for the reminder. Though I haven’t indulged for a while, u-pick’s a great option I think. As you note, it’s not all about cost. Picking is fun, you can make the trip an outing as you did, and you’re enjoying summer outdoors. 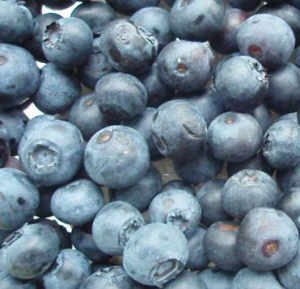 And you’re right–blueberries are tough to beat nutrition-wise. We’re lucky to be living near a huge blueberry-growing region, so the little gems are fairly inexpensive ($4 for 2 lbs) in the grocery store, fresh, when in season. They’re really nutritious, and a great addition to meals or as a snack. Your $4 for 2lbs deal is pretty good for store-bought!